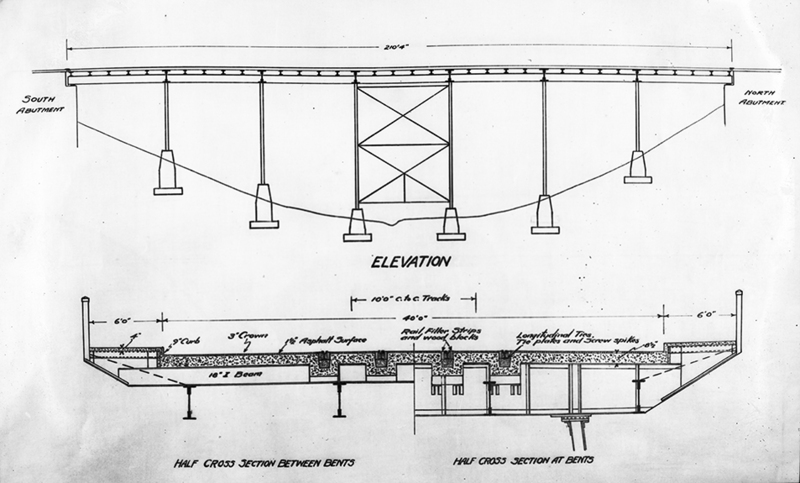 EA-75-879 Plans for Kinnaird Ravine Bridge, c. 1939, City of Edmonton Engineering Dept. Image courtesy of the City of Edmonton Archives. If you travel along 82nd Street approaching the west end of Kinnaird Park at 112 and 111 Avenues, you will come across a vintage bridge spanning over Kinnaird Ravine. This quaint metal bridge is named after George Johnstone Kinnaird. Born in Scotland, Mr. Kinnaird arrived in Canada as a Hudson Bay apprentice accountant in 1876. He travelled to Edmonton in 1886, still in service to the Hudson Bay Company as an accountant. After 1891 he was put in charge of the HBC commercial and store operations. In 1900 he left the company to work for the town of Edmonton, first as a secretary-treasurer, and after as one of the two first commissioners of the city. His job as commissioner lasted from 1905 to 1908, after which he left the city’s service and went into private business as an accountant. In 1911, he joined the auditing firm of Kinnaird and Henderson, and by 1915, he was appointed City auditor. Mr. Kinnaird’s family served their country in the Great War. Two of his sons died in the First World War and another son was severely wounded. A daughter lived with the family on Victoria Avenue. Mr. Kinnaird was also honoured with the naming of the ravine and park associated with Rat Creek. On the north side of the ravine, land was purchased by the City in the early 1900s. Rat Creek ran through this property, with the ravine bearing the same name. By 1916, the ravine was commonly known as Kinnaird Ravine, officially re-named in 1967, when Kinnaird Park was named. The park ran east from 78 Street through Rat Creek Ravine to the North Saskatchewan River. Norwood Boulevard, or 111 Ave, runs along the original course of the creek, and the ravine borders the Cromdale neighbourhood. A simple timber trestle bridge was constructed in 1909 over the ravine on Kinnaird Street, now 82nd Street. Wooden posts from the original bridge could still be seen directly underneath the bridge in 2002. The city owned the majority of the properties within the area bounded by the brick company and the CNR right of way. City planners at that time (1920’s) desired to keep the area wooded and park-like. Therefore, the planning committee advised against filling the ravine for a roadway, and they recommended a new bridge. The old wooden bridge was considered to compromise public safety . An increased population and the greater number of automobiles and trucks on city roads in the 1920s spurred on the decision to make bridge improvements around the city. Steel and concrete versions of a new bridge were proposed in 1931, but the steel construction designed by the city engineer was chosen . City engineer A.W, Haddow believed that the steel posts and girders allowed for a more flexible structure which was needed because of the “clay formation conditions”. The Dominion Bridge Company was awarded the contract at $27,000 for steel fabrication , and the steel bridge was completed in 1932 . A 1932 date of construction inscription is visible in the lower concrete buttresses on the south side at the east end of the bridge. The bridge had a simple but elegant appearance with hip caps on posts and narrow rails. It may have originally been painted with aluminum paint, giving it a grey colour, but at some point in its history was painted green, which was maintained until its rehabilitation after 2002. The upper part of the bridge is presently finished in a grey coating. Kinnaird Ravine Bridge c. 1939. Photo courtesy of the City of Edmonton Archives EA-75-878. Development in the area appeared to be industrial and residential by the 1940’s and 50’s, but it was very modest. Several large brick buildings near the bridge appear in photographs (Canadian Bedding Company, for example) . Some industrial buildings were in the vicinity by the 1930’s, including the North West Brick and Supply Company at 11148 82nd Street . The Kinnaird Bridge is the only bridge over what remains of Rat Creek, which is a significant geographical area in the history of Edmonton. Until the railway reached Calgary in the early 1880’s, Rat Creek was a landmark at the western end of the Carlton Trail, early Edmonton’s link with Winnipeg. It was significant to Major Sam Steele’s North West Mounted Police detachment coming from what is now southeast Saskatchewan. In the fall of 1874 Rat Creek was the last point for their 1500 kilometre horseback trip before reaching Edmonton Settlement and Fort Saskatchewan. The last 12 miles of trail into Edmonton were muddy and full of sloughs covered in thin ice. Wagons had to be unloaded, dragged out of the mud, then reloaded and moved. The police were so tired they did not bother to cross the stream, and camped at Rat Creek where it flowed into the North Saskatchewan River. At the camp the horses were cleaned, rubbed down, and put out to graze. Two rows of campfires were made, and a meal was prepared. While this meal was made, Sam Steele began work on a bridge over the creek. The party used the bridge to cross over the creek for the last four miles. The trail improved and they could see Fort Edmonton . Although Sam Steele’s bridge was in a different location than Kinnaird Bridge, it was the first bridge over Rat Creek, allowing for further trail development west into Edmonton Settlement. 82 Street – 110 Avenue, Rat Creek Bridge (north), circa 1940. Image courtesy of the City of Edmonton Archives EA-275-1750. As the city developed, Kinnaird Ravine was used as a dumping ground for garbage and construction debris. Sewage lines were built under the Rat Creek bed in the 1930’s. More enlightened use of the ravine appeared In 1974 when a jogging trail was cut through Kinnaird Ravine near 111 Avenue and 82nd Street, with the Canadian Militia Force laying down the gravel. The trail was called the “Kinnaird Ravine Fitness Trail”, or the “Kinnaird Ravine Trim Trail”. Five years later, part of the area was sodded by local Cromdale residents. Unfortunately, the ravine’s recent history has not been a particularly happy one. For many years, the ravine below the bridge has been the camping spot for some of the homeless population of Edmonton, with one of the homeless men living there dying after a fight in 2007. In some ways, however, there is a brighter future for the ravine. This November 2015, a large public art installation, the KinnArt Ravine Project, was initiated. Sixty murals painted by inner city youth were installed on the retaining walls of the ravine’s gravel trail, and will remain there at least until spring 2016. Edmonton Am CBC News “Murals replace grafitti along Kinnaird Ravine trail” Nov 07, 2015 (www.cbc.ca/…/murals-replace-graffiti-along-kinnaird-ravine-trail-1.33093..). Edmonton Historical Board, Historic Sites Committee 2004 Naming Edmonton: From Ada to Zoie / City of Edmonton. The University of Alberta Press, Edmonton, Alberta. Gibson, Jane 2002 “Historical Report and Recommendations Regarding the Replacement of the Latta and Kinnaird Bridges, Edmonton, Alberta” Alberta Western Heritage. St. Albert, Alberta. The Edmonton Journal, “More people living in city parks”, (canada.com) August 8, 2007. Jane is a local historic researcher who started working on Edmonton history in 1979 for the City of Edmonton as historic researcher/ planner for the Parks and Recreation Department. Her university background is in Anthropology, Western Canadian History, and Archaeology. She engaged in historic consulting in Saskatoon before working as the historic and built heritage specialist for a local archaeological consulting firm. She is presently an independent historic consultant.